Located just east of Panama City, Florida is Tyndall AFB, home of the First Air Force Headquarters. 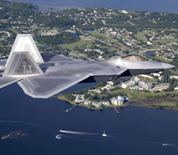 The host unit on base is the 325th Fighter Wing, which provides training for F-22 Raptor pilots and maintenance staff. The 53rd Weapons Evaluation Group is also located at Tyndall. The base serves as the initial training location for all of the Air Force's Air Battle Managers. Panama City is the largest city between Tallahassee and Pensacola and sits on Florida's Gulf Coast. It is a popular location for vacationers who want to enjoy warm weather and beautiful beaches. This Tyndall AFB directory features the critical info you’ll need to navigate through the many facilities and recreational opportunities available on base.